Something Completely Different . . .
Just because I thought a change of pace would be nice, I linked below to a peer-reviewed article I wrote for the DoD journal The Guardian back in my former life, when I was an anti-terrorism specialist in the Military Police. 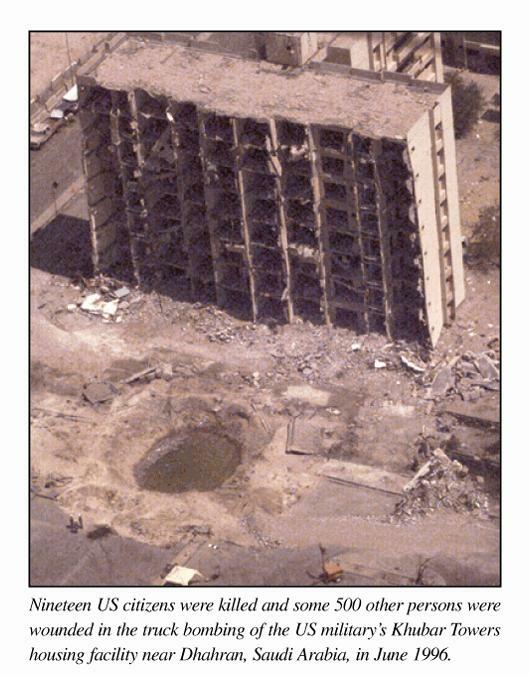 The article discusses the Khobar Towers terrorist attack on an Air Force barracks in Saudi Arabia in 1996. It was a tragic event, and in many respects the birth of modern anti-terrorism (or “defensive”) standards for our armed forces. If you are interested, the entire journal issue is here. Retired USAF Security Forces security specialist / anti terrorism guy here. Just got back on WordPress and back on my blog here and saw your article. Glad to run into you. Perhaps we can Follow and provide comments to each other. I used to be an Anti-Terrorism Officer when I was with the Navy Security Forces. Those days are behind me now! This is probably the only security-related article I’ll ever post here, though. My work is Christian ministry now. Take care and thanks for stopping by!